Have you heard the statement, change your thoughts to change your life? Well, we think that knowing your thoughts may be the first step in the process of becoming more authentic. And finding authenticity as a blogger has never been harder because we’re bombarded all day long with messages from others on how to get more followers on Pinterest, or how to get more likes on Instagram, or how to be the best blogger ever. Today’s guest is Cara Ansis of the site Fork and Beans. And if you struggle with authenticity in your blog, take some time to answer Car’s three secret questions. Read (and listen) on to learn more! 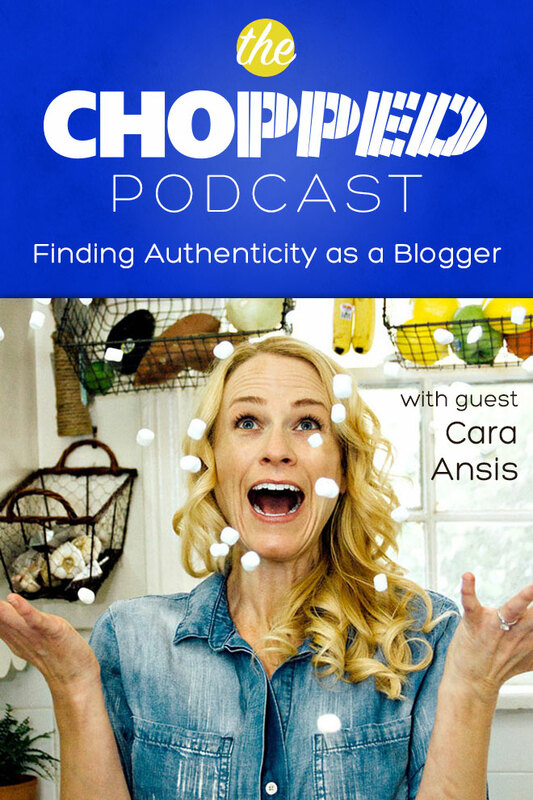 Finding authenticity as a blogger is job number one if you want to be successful. The problem is, we oftentimes look to other successful bloggers as a way of determining what works. Is my blog contemplative and reflective? Is my blog recipes only? 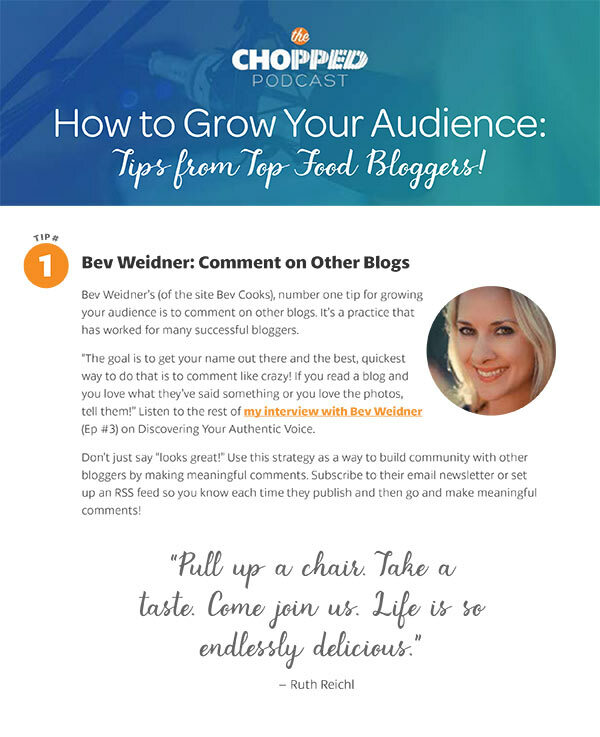 Should I share blogging tips on my food site? Should I share food photography tips on my food site? Do I spend time commenting on other sites to get more comments on my site? Should I spend hours every day on my social media strategy? Should I do all white backgrounds on my food photography? Or do I prefer dark photos? Do I tell my life stories in my posts? Or will I just stick to the recipe? Do you get my point? We’ve all seen blogs that are hugely successful with their zany, in-your-face style of writing. Think Thug Kitchen. We’ve also seen blogs that are successful with a more contemplative, poetic style of writing. Think Orangette. Some blogs are successful with wildly creative food photography. Think Lady and Pups. Others prefer a more simplistic food photography style. Think Simply Recipes. Know your strengths – what are you good at? Know your WHY – why are you doing what you do? Know your Audience – how will you share your WHY with your audience? Once you’ve answered those questions and know them in your heart of hearts, then you’re ready to tackle the next, big, hairy step. Failure. That’s right. Because in order to know whether you like dark photos or bright photos, or hilarious writing or contemplative writing, you have to be comfortable experimenting and failing. Because it’s in playing around with these different styles, and failing miserably at them sometimes, that you learn what really feeds your needs. Cara and I uncover the following steps to help you be the most authentic version of yourself possible. I will be honest, I wish there were a pill I could take that would make me more authentic. Without that magic pill, I’m left with copying others who seem really authentic. So I try on their style for awhile, only to crash and burn a few months later. Come to find out, copying others is not a pathway to authenticity. [insert disgusted eye roll here]. How can a person find authenticity? Cara and I agree there is no magic pill. The real answer is to go within. It’s not an easy process, especially when we have layers and layers of self-imposed or society-imposed pressures to act or be certain ways. But if you’re truly striving for authenticity, understanding yourself is the first step. Otherwise, you’ll think you’re steering the ship, but someday you’ll wake up and realize that you’ve been led by a strong undercurrent all along. What are some steps you can take to be mindful in your day? Routine. Be present during routine household tasks. For example, focus on the water as it rushes through your fingers when you do the dishes. Be mindful as your hands grab each dish. Stay present with the sensations you feel, both physically and emotionally. Meditate. See the links below for some amazing apps that can run you through some quick guided meditations. Even just a few minutes of meditation each day can be extremely helpful in the process of becoming more mindful. Power Pee. It’s sounds kinda crazy, but every day you have to go to the bathroom…several times a day (unless you’re working yourself too hard…which might be a sign you’re not being mindful enough). Each time you go to the bathroom, take a moment to yourself to check in. What emotions are you feeling? Take a deep breath. Relax. That’s a Power Pee, and it can work wonders in your day! Breathe. When we’re stressed, without thinking about it, our breathing can become very shallow. By taking a moment to breathe in deeply, you break that stressed out pattern in your day. Here’s what I call my Breathe³ deep breathing exercise: Breathe in to the count of three, hold it for the count of three, breathe out to the count of three, hold it to the count of three. Repeat that 3 times. You can't be authentic without having at least some time in your day that's mindful. — Marly McMillen #choppedcon Click To Tweet Give yourself time to be present with your emotions. Be aware of the river of emotions that run below the surface. Are you happy? Sad? Can you be an observer of your thoughts and detach from all your “to dos”? These are the beginning steps toward being more mindful. Here’s my favorite part of being more authentic as a food blogger. YOU get to define success. Is success making money? If so, how much? Or is success getting lots of comments? Is it getting quoted in the local paper? Is it being helpful resource to your readers? Is it just being able to say to people that you’re a food blogger? It really doesn’t matter because success is what you make it. Yes, you heard me right. You get to define what success is for you! Take a deep breath. You know this is true. Right? How many times do you feel like you’re chasing success? You find yourself looking at other bloggers and feeling like they’re more successful. You chase after page views or sponsored posts or views on Facebook like it’s the ultimate in success? Or maybe you feel like everyone else has got it ALL figured it out and you’re left standing on the edge of the sandbox, scratching your head. You feel constantly behind on everything. Just as you’re finally starting to figure one thing out, everyone moves over to another sandbox. All of these examples lead to one thing: a Limitation Life View (LLV). Don’t feel bad if you’ve experienced LLV. We all do at one time or another. The trick is finding ways to pull yourself out of that mindset. The best way to BE YOU, is to get out a sheet of paper and to answer Cara’s Secret Authenticity questions above. And it’s best to do that after you’ve had a few Power Pees. Because you can’t begin the journey toward authenticity when you’re hating on yourself. That is not the foundation you want to build your entrepreneurial life on! You cannot be authentic from a place of fear. You can’t be authentic from a place of falsity. You have to be honest with yourself. That’s the scary part. Do you remember yourself when you were two? No? Me neither. But I have this theory that two-year olds are entirely authentic. They’re not even aware of their social selves at that point, so they have no one else to be. These videos should remind us of how we start out in this world so playful. We’re looking for the fun in everything. We step away from this as adults, but it’s something we need to cultivate again, especially as bloggers where our creativity has to be tapped time and time again. You were seeped in playfulness as a child; find opportunities to be playful as an adult as well. For me, playfulness can be getting out my guitar. Or it could be getting out my colored pencils and taking a few minutes to draw something on a blank piece of paper. It doesn’t have to be GOOD…it only needs to be fun! One of the first rules of playfulness is being in a trusted environment. If you’re afraid people will make fun of you for dancing around your kitchen, then find somewhere else to dance. Create protected environments where you can truly be yourself. So, take time to play. Play a musical instrument, dance a little. Do something absolutely, tickle-your-fancy fun every single day! Our goal at ChoppedCon is to help you be your best each and every day. We feel confident that finding your authenticity in life can help with finding your authenticity as a blogger. We hope you love today’s episode with Cara Ansis! Participate in the Power Pee – every time you go to the bathroom take a moment to be mindful! Why not give Cara a shout-out on Twitter or Instagram and say thanks for the Chopped Podcast interview! Marly mentions her favorite meditation app, HeadSpace. She also uses: Breathe and 10% Happier by Change Collective. Learn about future Chopped Podcast episodes by subscribing to the ChoppedCon newsletter. Just add your email in the subscribe section at the bottom of this page. You’ll be glad you did! This post may include affiliate links, based on our recommendations for our favorite products. What a great episode! Thanks ladies for such an honest conversation. It was so helpful especially for a first year blogger like myself who’s struggling to find my “place” and the direction of my site. Hi Brie! Thanks so much! So glad you liked it. I love talking to Cara (and other bloggers) and realizing that we’re all just trying to find our place in this world. It’s comforting to know we’re all evolving all the time. xoxoxo!